In my experience, gluten free falafel is a rare find. Despite the fact the middle eastern dish is traditionally made from ground chickpeas and/or fava beans, most restaurants use a mix of wheat flour to make theirs. 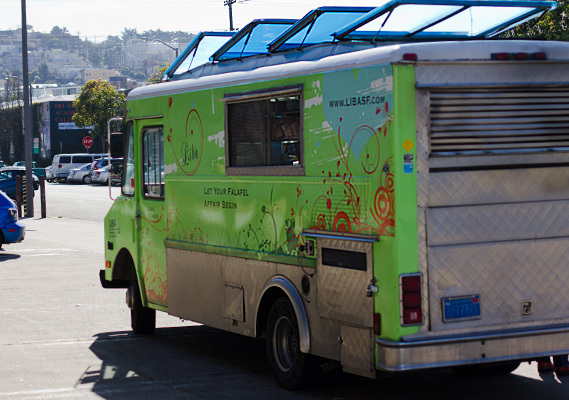 Lucky for those of us on a gluten free diet, Liba Falafel Truck serves some outstanding gf falafels and circumnavigates the Bay Area on a weekly basis (be sure to check the website to find their locations). Owner and operator Gail Lillian is happy to confess her falafels are gluten free and offers the entirely gf “falafel bowl” (3 of them on a bed of organic greens). The warm falafels are topped with a tangy Greek sauce and a variety of garnishes are available to add on yourself. Most of the toppings are gf, but a chance of cross contamination is definitely possible due to the nature of their salad bar set up. Be sure to complete your order with Liba’s sweet potato fries, served with cilantro, garlic and lime. 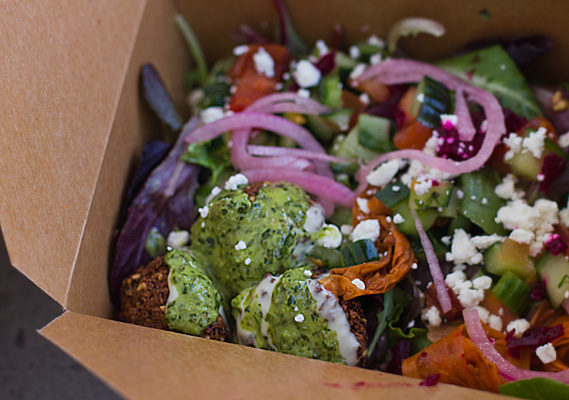 Liba Falafel Truck is all about organic food, sourcing local produce, and eco-friendly business practices like providing takeout boxes and utensils that are all compostable. The best part is, Liba Falafel truck parks right in my neighborhood every Thursday afternoon- what a treat! Also interesting about the straying from the traditional in mainstream US, must be cheaper the gluten way. Another case of cutting costs or maybe just lack of knowledge/skill to reduce quality and authenticity! Lucky you! This looks great! All organic and g/f!! Your blog is growing w/ all kinds of great new places, products. I love falafel! I have made my own GF ones before, but frying is a lot of work! FYI, the Old Jerusalem restaurant in the Mission (http://www.yelp.com/biz/old-jerusalem-restaurant-san-francisco) is pretty great and serves GF falafel.